It was fifteen minutes before Super Bowl kickoff. 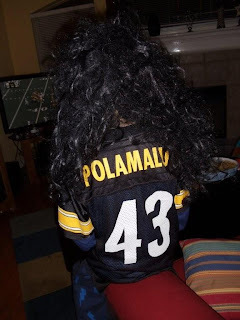 Eli 9.6 was coming down the stairs after his shower, dressed in his Troy Polamolu jersey. I was standing at the bottom of the stairs with a flashlight. Two stuffed snakes had been knotted together to make a red velvet rope, which was attached to the stairs, blocking his entrance to the living room. I turned on the flashlight, shining it on Eli's face. "Halt, please, sir," I said. He started laughing. "I can't let you in to the exclusive living room seating area unless you have a ticket. I looked at the ticket carefully, scanning it with the beam of the flashlight. 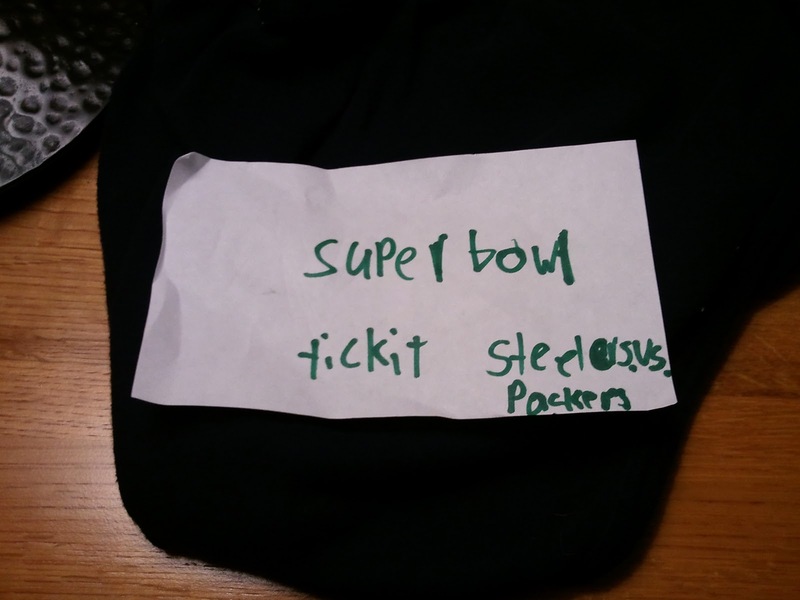 "Sir, I'm sorry, but this obviously not a real Super Bowl ticket," I said. "What?" he asked. "What's wrong?" "For one, 'ticket' is misspelled," I said. "Egregiously, I might add. "Second, this was clearly hand-written. I'm sorry, but I'm afraid you can't enter the super exclusive seating area unless you're one of the ultra V.I.P.s, and only one name is left on that list." Behind me, taped to the counter, was Eli's name on a blue sheet of paper. "Could you tell me your name, sir?" By this time, Eli was laughing so hard that he could barely talk, but he managed to get out his name. Of course it was laminated. "Welcome to the Super Bowl, sir," I said, opening up the velvet rope. "Oh, I see that you're a Steeler's fan. Please accept this Terrible Towel," I said, handing him his own licensed fan towel (that was Brian Pilnick's idea). "Enjoy the game." Eli went to the couch, found his seat, and sat down, still laughing. "Mom, that was ridiculous," he said. "Ridiculously AWESOME!" A good time was had by all, until the end, at least.